Attica Locke is one of those rare thriller writers who not only brings unrelenting action but throws in a hefty side of hard-hitting themes. I don't know that I've ever read another thriller that gave me this much to mull over afterwards. Usually I finish crime novels all like, “That was a fun and interesting diversion. Tra la la,” but not this time. Locke's main character, attorney Jay Porter, is a complicated and tortured man. As the book opens in 1981, Jay is stable, married, awaiting the arrival of his first child, but his life is about to be thrown into total chaos. It begins when Jay witnesses a crime he won't fully understand until much later. Most people would go to the police to report what they saw, but Jay is wracked with residual paranoia from his college days, when he was active in the Black Power movement. He narrowly evaded significant prison time then, and he's terrified of getting involved in anything now that could land him back on the wrong side of the law. So he keeps his mouth shut, like he's always done. This time, though, trouble follows Jay as if it were tied to his ankle. He's involved whether he wants to be or not, and he has no idea who he's dealing with or how high up the corruption goes. There are so many big ideas in this story—the oil industry, environmentalism, workers' rights, civil rights, collective bargaining, industrialization, government spies—it's no wonder it takes over 400 pages for Locke to tell it. What is a surprise is how quickly she makes those pages fly by. I was fascinated by Jay's character, but I hardly had any time to reflect on his choices and motivations because something exciting was always happening. There are so many jaw-dropping, heart-pumping scenes throughout the book. 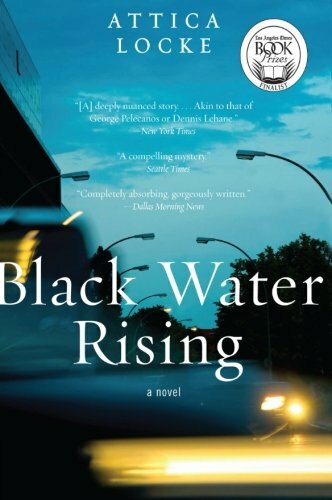 Usually that's not my thing; I often find myself sighing with boredom and skimming through action-heavy sequences, but not with Black Water Rising. The tension is incredible. And here's some good news: a second Locke novel featuring Jay Porter is scheduled for release April 21! You can bet I've already joined the hold list at my library for that one.